The inauguration of an original and exceptional exhibition entitled "100 Years since the October Revolution. A trip through History, with our eyes on the future. Exhibition of Stamps and Documents” took place on the afternoon of Tuesday, October 17, at the Municipal Art Gallery of Piraeus and will be open until October 28th. This is yet another KKE initiative within the framework of activities it is organizing to commemorate the Great October Revolution. 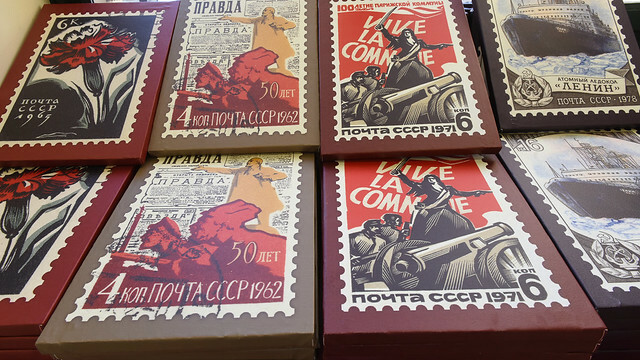 The exhibition features stamps depicting the anniversary of the establishment of the USSR, the Red Army, the revolution of 1905, the birth of great revolutionaries and theorists, the huge achievements of the USSR, economic, industrial and agricultural production, the success of Central Planning, health, education, sport and the exploration of space. Other stamps are dedicated to the action of the pioneers, to children, to the unique role of women, the great poets, the writers, the leading scientists of humanity. The exhibition features a display of rare books, Soviet literary magazines as well as Red Army uniforms and decorations.